The enterprise flash storage market expected to register a CAGR of 13.67%, during the forecast period (2018-2023). A huge amount of raw data is being generated everyday, leading to data storage crisis for the companies. The enterprises storage market is presently the most active place; storage users have been subjected to repeated hype for the last couple of decades. 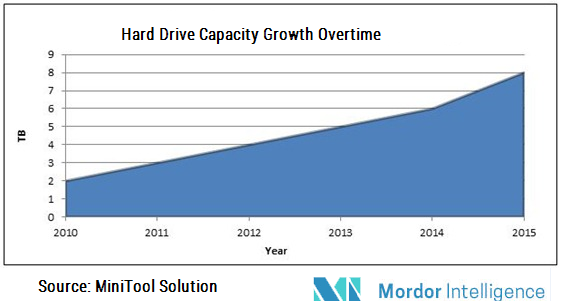 People have shifted from hard disk drives (HDDs) to solid-state drives (SSDs); they are further expected to move towards the upcoming all-flash arrays (AFAs). Enterprises are trying to figure out a way to deploy approaches to gain maximum return on investment strategically. There has been a rapid growth in the flash drive revenues over the last few years, with enterprise storage devices recording a 50% annual growth per year. The scope of the study is segmented by End-user industry, such as IT Industry, Defense, Chemicals, Automotive and Electronics, and region. Information is a critical business resource, and like any other critical resource, it must be properly managed and protected. Information storage and exchange needs to be secure to ensure an efficient record management. The dire need for faster and robust devices to process and store data is rising rapidly as the amount of data being generated is growing at an unparalleled rate owing to the technological advancements. The need for faster performing devices has led to the implementation of the idea of flash storage. Flash is a memory type that works efficiently and quickly as compared to the conventional HDDs, without continuous power. Solid-state drives nowadays are being implemented with the NAND-based flash memory to allow the memory to retain data without the power as well. Flash storage can boot in a matter of seconds and handle large workloads much more efficiently, which makes it for complex data sets and operations. Businesses require fast processing for their applications and quick access to stored data. This makes flash memory storage an ideal application for their use. Beyond function, another important attribute of the flash storage is its durability; this can be attributed to the fact that it does not have any moving parts unlike the hard drives, which are spinning on disks. Such a factor plays a very important role in data security where the data is not lost easily as the device is not damaged often. Lack of parts makes it run more efficiently, thus making is a cost-effective option. Additionally, flash storage does not require much power to run, compared to the other hard drives. This adds to their popularity in the market. Rapid growth in the usage of storage devices is justified by the increase of data being generated and processed by the companies. SSDs were primarily being used either in consumer devices, or to add a little boost in the performance to a server or storage array. The market has evolved considerably since then, as research proves that the usage of storage devices has moved into almost every area of the data center and penetrated into different areas within IT. Demand for the flash devices will remain strong in both the client and the enterprise markets for the next few years owing to the advancements in technology, which increases the availability of better technology at a lower price. HDDs are not exhausted in the market and they still hold a considerable share. The IT industry relied immensely on the hard drives to store data before the evolution of cloud and online drives. However, the rate of growth of the flash storage devices is significantly higher in the market. This transformation is slowly underway, but an effective solution to store data physically enables data security more than any other online database that is used for storage. North America is the region where most of the companies have their origin, and hence have developed a base to experiment before adopting it on a large scale all over the world. A lot of active data in the enterprise data center is moving from the legacy disk to the flash implementations. Upcoming startups in the whole of Silicon Valley are bent on developing products. Hence, they generate huge customized data sets. Moreover, as corporate espionage on any scale is dangerous, having a physical data storage device is always more helpful than storing it in cloud or online drives. Flash storage is evolving continuously and rapidly at a rapid pace and these rapid advancements will drive the price of this expensive technology lower, thus, making it a much more widely used tool by the enterprises, which cannot afford it. Small and medium sized companies rely on faster access and processing of huge amounts of raw data, which make flash storage devices the ideal solution. November 2017 - AccelStor launched NeoSapphire H710 all-flash array. The most common demand and need for HPC is expected to come from scientific researchers, engineers, and academic institutions. NeoSapphire H710 is expected to benefit extreme-scale computing, reliability and high availability. Major Players: Pure Storage, Virident Systems, Inc., Violin Memory, Oracle Corporation, NetApp Inc., EMC Corporation, Kaminario, Nimble Storage Inc., Nimbus Data Systems Inc., Skyera Inc., Tegile Systems, Inc., Western Digital Corporation, WhipTail Technologies, Inc., LSI Corporation, and Fusion-IO, Inc., among others. 4.2.1 Evolution of Hybrid Flash Arrays and surge in sales of AFAs. 6.9 Nimbus Data Systems Inc.